Don’t let a fear of preparing the perfect risotto defer you from trying this dish. 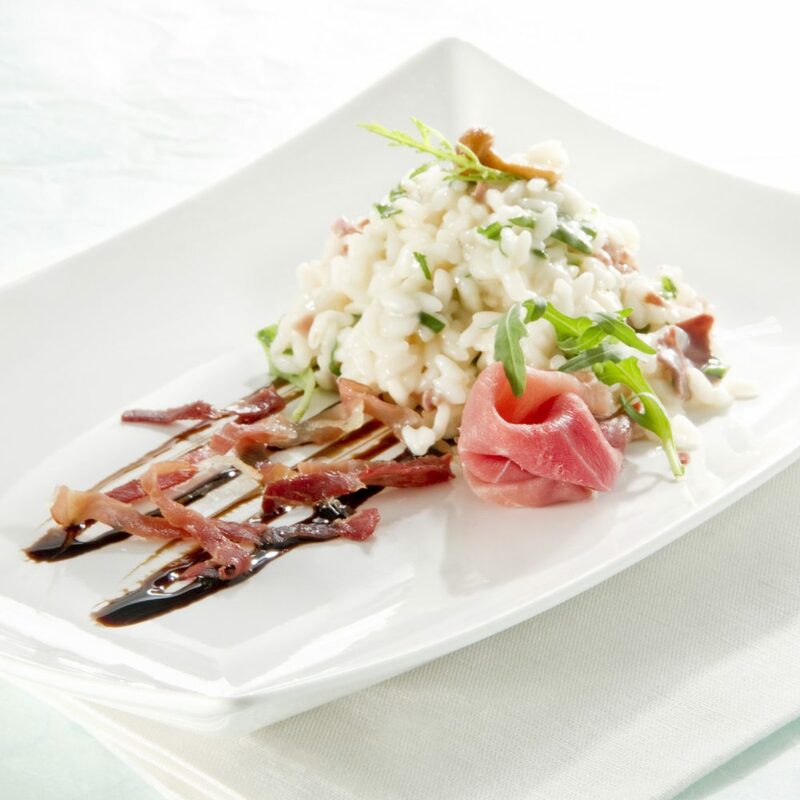 The typical mushroom risotto becomes anything but boring after adding the Italian stracchino cheese and Prosciutto di Parma, sautéed in balsamic. As either a prosciutto appetizer or entree, this Mushroom risotto with prosciutto and cheese is a dish for everyone and every season. Pair this prosciutto risotto with your favorite white wine, or capture the earthy flavors of the mushrooms with a Beaujolais. Fry the chopped onion in a knob of butter until golden brown in a high sided pan. Add the rice, sauté and then pour over the wine. Clean and cut mushrooms into strips, add to pan and cook until soft. Then start adding boiling vegetable stock. In a small non-stick pan, heat a drizzle of olive oil and sauté a few thin slices of prosciutto, cut into fine julienne strips. Add the balsamic vinegar and allow to evaporate partially. Continue to stir the rice and add the stock a little at a time until it is cooked. When the rice is cooked, remove from the heat and add the remaining ingredients: rocket, roughly chopped with a knife, additional butter, stracchino cheese and a handful of grated Parmigiano cheese. Stir well, and when the cheeses and butter have melted into the rice, plate up and garnish with the strips of prosciutto and vinegar. Complete with prosciutto slices rolled into rose shapes.